There are many advantages that our CNC truing system provides; these advantages provide a direct cost savings to your company. One of the beneficial aspects of this service is that it is totally portable and can be used “right out in the field.” If there is a need to true the wheels at any time or at any place, it can be done! There is NO need to remove the wheel set. 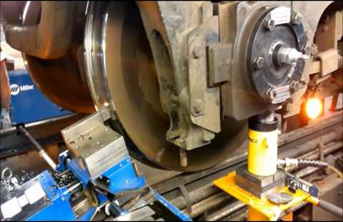 This also eliminates the cost associated with shipping the wheel set to a reconditioning facility, or sending the entire locomotive to an in ground truing system. The down time is drastically reduced and is controlled by you. The process is easy and fully controlled by CNC programme. Thereby accuracy & dimensions is controlled. 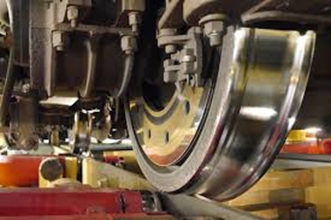 All Indian Railway profiles are preset and hence desired wheel profile is achieved. Removal of some of the brake rigging components, if necessary. Lifting of the axle which is best done by jacking up the journal boxes. Leveling and clamping of the machine to the track. Selecting the X and Y axis Home position. Touching off the cutting tool insert on the inside of wheel and top of flange, which communicates to the controls where the wheel is in conjunction of the Home position. Now you are ready to run!